White, on short spikes amongst leaves. Petals thick, waxy : anthers with spring mechanism. 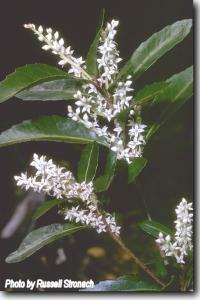 Spreading shrub or small tree. Leaves have a nauseating smell when crushed. Tas. endemic. Local in rainforests of the central plateau and the south-west and west coasts. A small tree in rainforest on poor sites and understorey shrub in wet eucalypt forest. It also occurs in scrub and heath on poor soils in the wettest parts of the state, extending into the margin of the alpine zone. Susceptible to Phytophthora cinnamomi. Not suitable below powerlines. Cultivation has proved very challenging. Plants are difficult to propagate and then grow very slowly. Requires well-composted soil in shade.